Sherry FitzGerald is bringing to the market No 46 Glenanail Drive, Riverside, Tuam Road, Galway, a wonderful three bed semidetached home. Riverside is a mature established residential development approximately 1.5 miles from the city centre. It is close to all amenities including shops, schools, and restaurants. 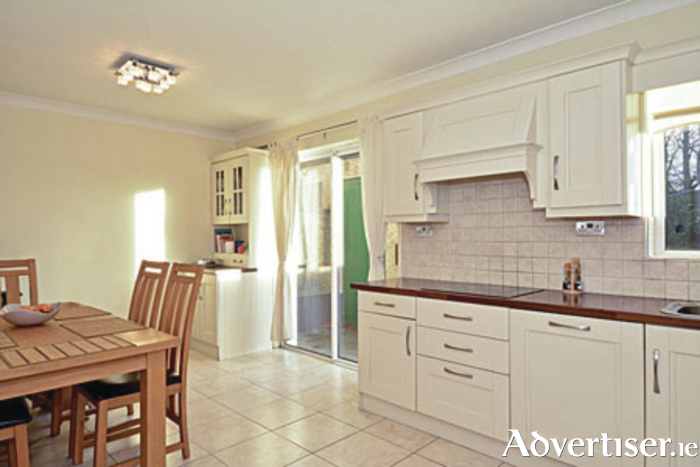 This owner occupied home is in excellent condition internally and has been lovingly maintained by its current owners. Size is 88.6sq m (954sq ft ) approximately. It benefits from having a bright and spacious kitchen/dining room with tiled flooring, fully fitted kitchen with modern kitchen units, and sliding doors to the rear garden. The living room has a solid timber floor, open fire with cast iron surround, and back boiler. Upstairs there are three bedrooms, all with timber flooring and built-in wardrobes. The property is complete with a bathroom which is partly tiled and has an electric shower. The BER is D1 on BER cert no 101166122, with an energy performance indicator of 255.22 kWh/sq m/yr. This property comes with off street parking to the front and a large back garden with clearly defined boundaries. If you are looking for a home or a quality investment, this could be the property for you. Asking price is €198,000, and viewing is recommended.